One of the most frustrating limitations of SQL Server 2005 Standard edition is that it doesn’t support semi additive measures in SSAS Analysis Services cubes. This post explains a work around that provides similar functionality without having to shell out for the Enterprise Edition. What Are Semi Additive Measures? Semi Additive measures are values that you can summarise across any related dimension except time. For example, Sales and costs are fully additive; if you sell 100 yesterday and 50 today then you’ve sold 150 in total. You can add them up over time. Stock levels however are semi additive; if you had 100 in stock yesterday, and 50 in stock today, you’re total stock is 50, not 150. It doesn’t make sense to add up the measures over time, you need to find the most recent value. Whether they are important to you or not depends entirely on what you are trying to do with your cube. If all of your required measures are fully additive then you really don’t need to worry about anything. However as soon as you want to include measures such as stock levels, salarys, share prices or test results then they become pretty much essential. Why are they not available in SQL Standard edition? Microsoft has to have some way of pursuading us to pay for the Enterprise edition! How can I get this functionality within SQL Standard? Firstly we need to understand what semi additive measures do. By far the most common aggregation used is the LastNonEmpty function, so we’ll stick with that as an example. This basically says that whatever time frame you are looking at, find the most recent value for each tuple. This really is a fantastically powerful function, which only really becomes apparent whan you don’t have it! Lets say that you perform a stock take of different products on different days of the week. You will have a stock entry for product A on a Thursday and product B on a Friday. The LastNonEmpty function takes care of this for you, if you look at the stock level on Saturday it will give you the correct values for both A and B, even though you didn’t perform a physical stock take on the Saturday. If you then add the time dimension into the query, SSAS will perform this function for each and every time attribute shown, and then aggregate the results up to any other dimensions used. i.e. 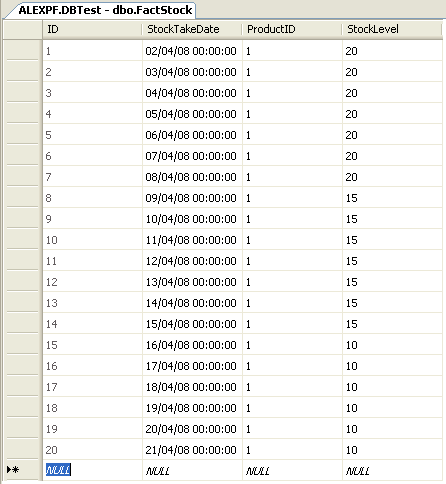 Each month will then display the sum of all LastNonEmpty values for all products within that month, essentially the closing stock level for each and every month. To replicate this in Standard Edition, we need to split the work up into two stages. 2) Use MDX to select a single value from the time dimension. Think of this as splitting up the LastNonEmpty function into two, ‘Last’ and ‘Non Empty’. The ‘Non Empty’ bit essentially fills in the blanks for us. If a value doesn’t exist for that particular day, it looks at the previous day’s value. The ‘Last’ bit says that if we are looking at months in our query, find the value for the last day in that month. The same goes for years, or indeed any other time attribute. To code up a full LastNonEmpty function ourselves in MDX would be too slow to query as soon as you get a cube of any reasonable size. One of the key benefits of a cube is speed of querying data and we don’t want to impact this too much, therefore we move some of the donkey work into the ETL process populating the datawarehouse. This leaves the cube to perform a simple enough calculation so as to not cause any problems. We need to expand this into a new fact table that contains one record per day per product. There are a number of ways of doing this, I’ll describe one here that should suit most situations, although you may need to customise it to your own situation, and limit it to only updating changed/new records rather than re-populating the entire table, but you get the idea. I should point out that you would be much better off populating this as part of your ETL process, but I’m showing this method as it’s more generic. Now that we have a large fact table consisting of one record per product/date, we can load this into the cube. If you just add the StockLevel field as a measure and browse the results, you’ll quickly see that if you view it by month, you will get each day’s stock level added together giving you a non-sensical value. To fix this we need to tell Analysis Services to only show one day’s value. --Please modify to suit your own date hierarchy! You could aso use HEAD() if you wanted to find the opening stock instead of closing. And there you have it, semi additive measures in SQL Server 2005 Standard Edition! Even though this method does work well, it is still not as good as having the Enterprise edition. The built in functions of Enterprise will perform significantly better than this method, and it saves having to create the large (potentially huge) fact table. This process will also only work on a single date hierarchy. If you have multiple hierarchies (i.e. fiscal and calendar) you will need to enhance this somewhat.